As pointed out on Greater Ottawa and OpenFile Ottawa, the City of Ottawa released its quarterly performance report for the third quarter of 2010. 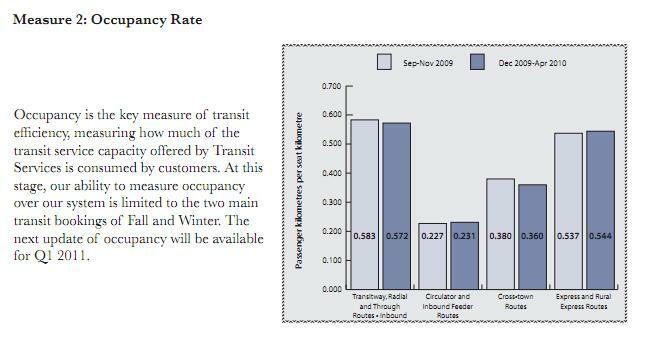 It's an interesting document with some revealing numbers, and of course some of those include public transit in the city. 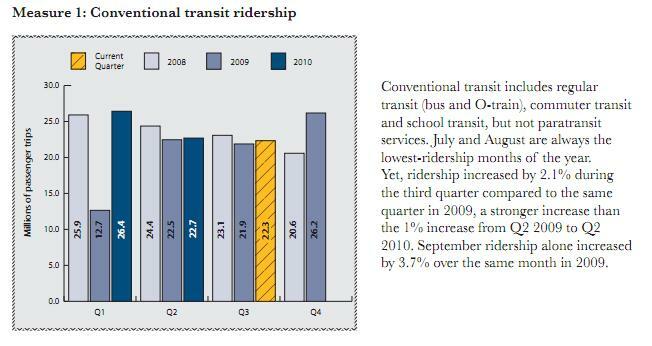 First up, conventional transit ridership. Although it would be nice to be able to project a full-year total based on the first three quarters, it'd be tough to do so due to the transit strike the spanned Q4-2008 and Q1-2009. 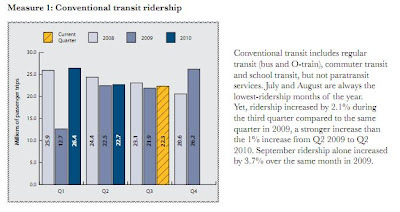 Based purely on Q3 numbers, ridership is up from last year, but hadn't returned to pre-strike levels. Next, occupancy rate on buses. 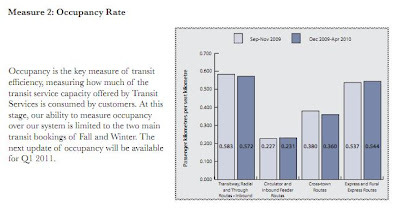 It's pretty impressive that Transitway routes (I'd have to assume that means the 90-series buses, like routes 94, 95, 96, 97) operate at a terrific occupancy level compared to other routes. Considering the 95 runs 24 hours on weekdays and operates at, I would estimate, about 5 per cent capacity for those late-night runs, the daytime routes have got to be very full (and they are). Of note, also, is that occupancy on express and rural service has improved since last year. Third, on-time performance. I bet if you asked most transit users, they'd estimate a much different distribution of numbers, but routes operating between 0-5 minutes late is kind of perfect. Although as an editorial note, just because a route is on time doesn't mean it does me any good; two on-time buses blasted right by me today, for instance, because they were packed to the gills and couldn't get one more rider on. And finally, the percentage of trips operated. 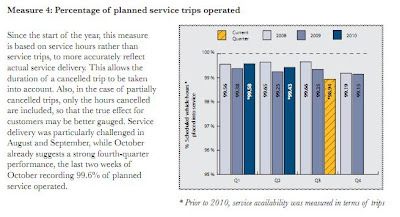 Again, transit users would likely estimate an even lower number, but it's still worth noting that Q3-2010 is the worst quarter of any of the three years presented when it comes to actual service operation. Some very interesting figures for transit enthusiasts, for sure. An important note about the way that "on-time service performance" is measured: as indicated on the graph itself, these figures only account for performance during the "morning peak" period. 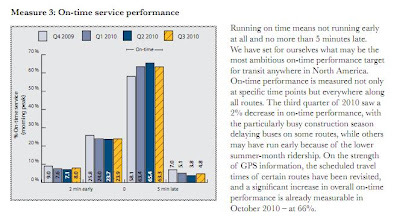 What bothers me is that no attempt is made (here or in previous quarterly reports) to justify this use of the morning peak numbers as somehow exemplary of the system's overall on-time performance. I think it is safe to say that the equivalent numbers for the afternoon rush hour (when downtown traffic is worse, dwell time at urban transitway stops is longer, etc.) would not be so rosy. I'd like to see occupancy rate figures for the 95 during evening rush hour. I'm interested to see how high the bar in the graph would go for the "this bus is so freaking full of people that some have to stand ahead of the yellow line next to the driver" category. 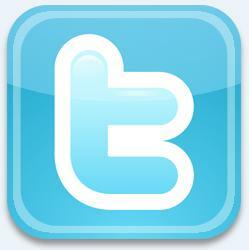 Anonymous, the same is true of many runs of the No. 12 bus. Ever since the split in 2008, OC Transpo has been cutting run after run after run on this route, to the point where there are now 16% fewer daily runs than there were before the strike. Just to make things that much more special, many of those runs are on 40-footers, too, when the old No. 2 was almost exclusively artics. And the icing on the cake is the numerous runs of the 12 that either start late at Kent Street, or don't show up at all. 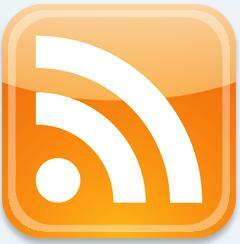 The super-magic split, of course, was intended to IMPROVE schedule adherence. Those wacking OC Transpo comedians! If you ask OC Transpo, however, they have no reports of overcrowding on the 12. Steve makes an important point - the performance reports only show on time performance during the AM peak. Also, the exclude some routes like the 95. We we should make clear to the Transit Commission that this is not acceptable. We must know the on time performance at all times of the day/week. I do not think the Transi Commission members understand the issue or the problem.